With their sharp optics and natural color rendition the MINOX HG binoculars already rank in the top binocular engineering class. Now MINOX engineers have been able to extend the field of view by up to 15 %, demonstrating the latest technologies in the manufacturing of high quality binoculars. These binoculars are made at our parent plant in Wetzlar, a further reference for highest optical performance. The new MINOX HG 8x33 comes complete with an exclusive case, neoprene strap and rainguard. 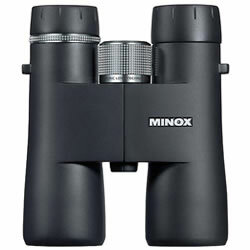 MINOX HG-binoculars come complete with an exclusive case and a neoprene strap. 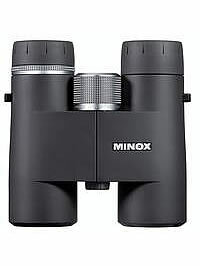 MINOX ultimate aim was to ensure performance at the highest level when they developed and designed their new HG binoculars. The German engineers in Wetzlar, Germany have created High-Grade-Sport optics with the best possible performance in every area that defines a quality binocular. By using special optical glass from German glass specialist SCHOTT AG, a newly developed optical system provides a fascinating high level of light transmission which is bound to be highly rated for brightness and contrast. With their sleek body design and magnesium housing, the HG binoculars are real lightweights at the top end of the range and along with their beautiful cosmetics and ergonomics they ensure the end user will enjoy a satisfying new experience when using the all new Minox HG binoculars. Apart from optics, Minox have also installed a 'first' as the innovative QCF focusing now makes it possible to take exact distance readings from a scale on the focusing wheel, an often looked for feature on binoculars. With these exciting features and given quality, the MINOX HG is todays trailblazer that has all the quality and features potential to become tomorrows classic. Top quality light transmission is an essential mark of quality in binoculars. MINOX engineers developed the innovative M*-coating of the lenses which consists of up to 21 different layers on the glass surfaces, adapting the various wavelengths of the visible light. This increases the overall light transmission to an impressive 92 percent, while improving brightness, contrast, detail and colour rendering significantly. Another benefit is a completely new optical system designed by our in-house experts with internal anti-reflection and anti-glare coatings to help improve contrast. The four models, an 8.5x43, 10x43, 8.5x52 and 10x52 feature aspherical lenses to enhance the contrast and sharpness of the image from centre to edge. To provide a reliable and durable protection against internal corrosion and fogging, the binoculars are filled with state-of-the-art Argon gas. Another milestone is the mirroring of the roof prisms through the MinoBright technology. This silver-based coating guarantees an improvement of up to 99.8 percent efficiency of the light reflected at the mirror surface. This is yet another improvement towards better light transmission within the system of the HG-binoculars. The high-tech optical glass is Made in Germany by the Mainz based SCHOTT AG, a company of the Carl-Zeiss-Stiftung, which was founded by Ernst Abbe. High technology originating from German glass pioneers used for innovative optical products by the Wetzlar based optic specialists of MINOX. All of the expertise from MINOX, a trusted industry pioneer, is combined in this high quality product. 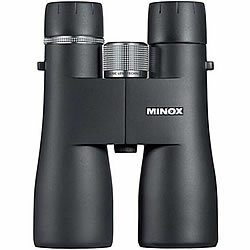 Despite all their features the new MINOX HG-binoculars weigh just 650 grams. This puts them amongst the very best lightweights at the top end of the range. The sleek body design with its protective rubber armouring was designed and fitted around the natural position of the hand. The weight was reduced considerably by using a magnesium alloy, which is increasingly used in aircraft construction. With its much lower density compared with aluminium and its extreme durability, magnesium is a revolutionary material for modern, tough housings of binoculars. The eyepieces are fitted with twist-up eyecups with four click-stop positions. This gives more freedom for an individuals own eye-relief settings. The design of the large metal focusing wheel is both attractive and functional. Equipped with a cross-knurl, like the diopter-adjustment, providing a very good grip. Powerful twilight performance, top class technology and a sophisticated design  the new HG 8x56 from MINOX perfectly complements the pre-vious high-grade binocular series. The HG 8x56 with extreme light gathering power is the ideal companion for observation or hunting in moonlight or in twilight conditions.By using special optical glass from German glass specialists SCHOTT AG, a newly developed optical system provides a fascinatingly high level of light transmission which is bound to be highly rated for brightness and contrast. Apart from optics, Minox have also installed a 'first' as the innovative Quick-Close-Focusing (QCF) now makes it possible to take exact distance readings from a scale on the focusing wheel, an often looked for feature on binoculars. With these exciting features and given quality, the MINOX HG is todays trailblazer that has all the quality and features potential to become tomorrows classic. Top quality light transmission is an essential mark of quality in binocu-lars. MINOX engineers developed the innovative M*-coating of the lenses which consists of up to 21 different layers on the glass surfaces, adapting the various wavelengths of the visible light. This increases the overall light transmission to an impressive 92 percent, while improving brightness, contrast, detail and colour rendering significantly. Another benefit is a completely new optical system designed by our in-house experts with internal anti-reflection and anti-glare coatings to help improve contrast. Thanks to the additional MINOTEC coating on the lenses any adhering dust or dirt particles can be simply wiped away. Even droplets of water pearl off with ease, making outdoor use much more convenient. To provide a reliable and durable protection against internal corrosion and fogging, the binoculars are filled with state-of-the-art Argon gas. Another milestone is the mirroring of the roof prisms through the Mino-Bright technology. This silver-based coating guarantees an improvement of up to 99.8 percent efficiency of the light reflected at the mirror surface. This is yet another improvement towards better light transmission within the system of the HG-binoculars. High technology originating from German glass pioneers used for innovative optical products by the Wetzlar based optic specialists. All of the expertise from MINOX, a trusted industry pioneer, is combined in this high quality product. The rotating eye cups for people wearing glasses - found on all MINOX binoculars - can be adjusted in four fixed stops. The new MINOX HG 8x56 comes with an exclusive case as well as a neoprene strap.